Wanting to put a super charger on my Indmar 340? I know pro charger builds them for MerCruiser, I'm sure it's nothing they couldn't engineer. They do some pretty wicked stuff. No one makes a kit specifically for an Indmar motor, though any GEN-I SBC kit could be made to work. That said, you are going to want a screw-type blower, not an centrifugal style. You will also need to be able to tune the motor somehow, bigger fuel pump/injectors and I'm not sure how much the bottom end can take on a boating application. Likely some bracket and intercooler fabrication as well. I'd expect a minimum of a $10,000 investment (excluding any internal motor work) if you do 100% of the work yourself, including tuning. Nitrous is spot on. Tuning will be your biggest challenge. I assume since it is a 340hp Monsoon, you are out of warranty but if not, you will void it with the addition of any power adders. With what goal in mind? I have installed blowers on a few cars and helped with some trucks. I am sure someone out there makes a roots style blower for it. Just need to do some research I would bet. Air flow. Even with the right tuning, getting enough air into the box for that puppy to breath properly is going to be a challenge. There was one tournament boat that I can think of that was supercharged from the factory, by Mastercraft in the '90s (if memory serves it was a factory option on the PS205 for only a year or 2). They put a scoop on the motor box to accommodate the increased need for air. I spoke with a guy that owned one years ago & he said that when you started laying the wood to the throttle, that the sheer volume of air being pulled into the box was impressive. Couldn't you get a brand new bigger engine for way cheaper than $10K. PS 197. There was one single 35th edition that got one too. His problems with it were hinted at pretty heavily "over there". Off the water for a few seasons trying to get Indmar to get it working, finally I think he had a third party work it out to where it's usable again. Makes sense, will be a project for sure. Nothing plug and play that any of us have seen, but anything can be done with enough determination and knowledge sources. So what is the boat and have you done one of the new big props yet if they'll fit? Just go big and drop in an LSA. Thank you, I couldn't remember which model it was. Gotta say, seeing the scoop on that thing & understanding exactly what it was for was wicked cool. Get Procharger out of your head. They sell centrifugal superchargers (I have a D1-SC for my Formula)...good for high HP offshore boat setup, awful for a tow boat application. You need to get a screw type of supercharger (which will be a lot more money). The ECM's you want to use are not marine-oriented ECM's. Could you make it work - perhaps - but there are marine options available. Indmar is simply offering the LSA. Indmar doesn't make any motors - they just bolt accessories and do their own tune on GM Marine crate motors. Also, your bell housing won't mount up going from a GEN-I to a GEN-III+ SBC. Air flow. Even with the right tuning, getting enough air into the box for that puppy to breath properly is going to be a challenge. The LSA's don't seem to be having any problems @ 555HP. Look into a company called ACME, or another one called OJ. These supercharger threads seem to come up about once per year. I've never heard of anyone actually going through with it. To the OP, if you end up trying this project, please let us know how it turns out (with pictures, of course). 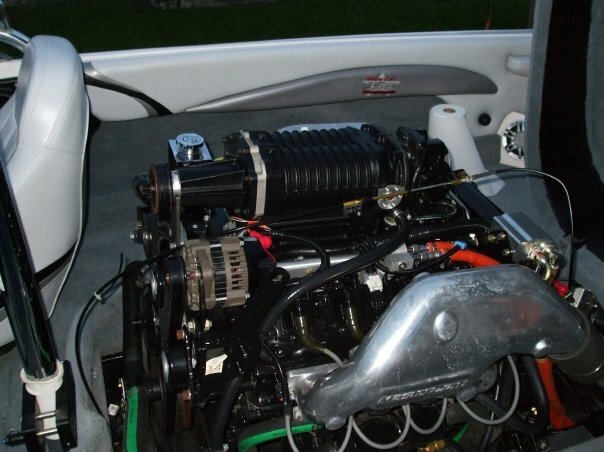 I saw an interesting thread a while back with an Mastercraft X80 getting a diesel engine. Can't find any info on the elusive Superchaged PS197. I think the rest were for Ski Flying competitions, but I'd have to go and search to verify. Ah ok. There is a member on one of the mastercraft forums that has one. absolutely get it out of your head that you are going to save gas putting a blower on a towboat engine. I know in cars and trucks your highway MPGs can go up 1-2mpgs. Not in this application, as you are spinning 3000-5000rpms to do just about anything, not a liesurely 1700rpms down the highway like in a truck...... so figure a 20-30% increase for the same activity vs just running the non-supercharged motor harder to keep up, and the required 91 or 93oct fuel at that, .35-50 cents more per gal. I watched my GPHs on the 550hp very closely this weekend, averaged 8-10gph using 100% pure 91OCT, boat +ballast around 12,000lbs, turning 3200-3300rpms. Same load on the same boat with the 450hp was 6-8gphs. Now, however..... what you DO get, is percieved unlimited power, completely loaded down, sac'd heavy with as many folks as you can fit in the boat. wow. 30 bucks and hour. I'm not sure that I could fully assess his progress with just pictures. I think I would need a pull. Anyway, since you only want a little boost at constant RPM, how about a turbo? Apples to oranges, but my ski buddy has a Eliminator boats "Skier 20". Most of it's life has been with supercharger (454, 3 speed v-drive). Although the last rebuild he went normal aspiration. Fast and powerful yes, very loud, high maintenance for everything on the engine. And it didn't get good mileage, ha. Does anyone know how the drive train works, assuming one prop?